Have you ever wondered how it feels to be underwater, weightless in a three dimensional world? Have you ever wanted to experience the thrill of scuba diving but do not know where to start? We offer try a dive sessions in the pool, 8pm-9pm—the perfect opportunity to discover the underwater world without having to commit to a full scuba course. Under your instructor’s expert guidance we will introduce you to diving in a safe pool environment—you do not have to worry about anything. We meet at Stratford upon Avon Leisure Centre every Thursday from 7.30pm—if you want to Try Dive, then please contact the recruitment officer today who will book you a place. You do not need to be an especially strong swimmer, though you will need to be comfortable in the water. 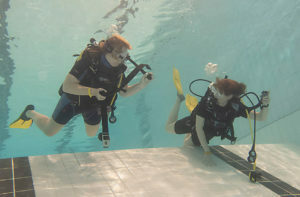 We provide all the equipment needed, and there is no further obligation to learn to dive or to join the club. Prices can be found here. So, come on all you budding Jacques Cousteau what have you got to lose?